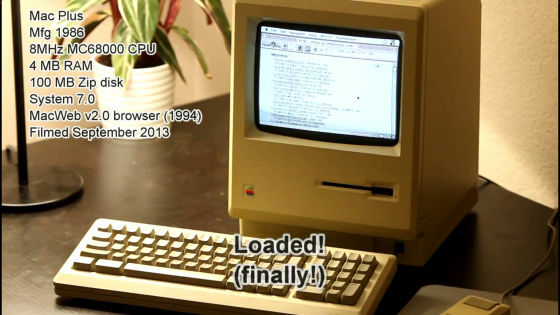 What happens when connecting to the Internet with a Mac purchased 27 years ago? 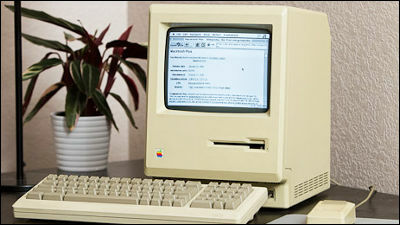 A man who says "old PC is like a classic car" purchased in early childhoodMacintosh PlusWhen I connect to the Internet, I show the appearance of what I actually tried. However, in order to actually connect, it seems that it was necessary to overcome both hardware and software problems and it was not easy. Jeff Keacher went to the Internet when the CPU was 8 MHz, the memory was 4 MB · Macintosh Plus with 50 MB of hard drive capacity. 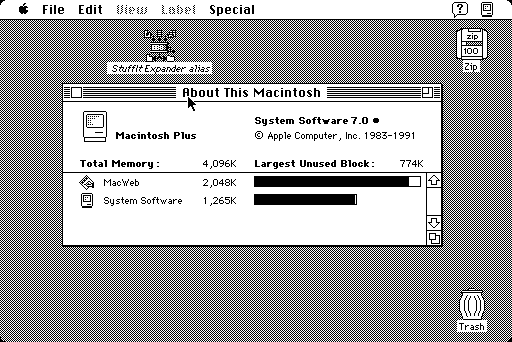 The resolution of the display is 512 × 384 px, the installed OS is System 7.0, and the browser is Macweb 2.0. 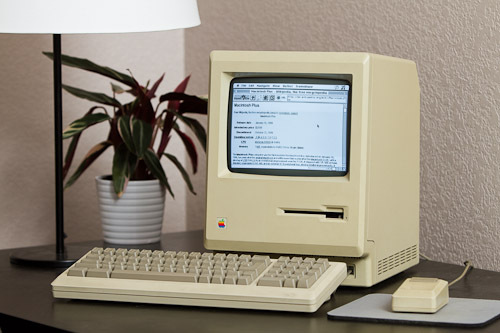 As Mac Plus does not have an ethernet LAN port etc, the problem of how to connect Mac Plus to the router running the home network originated from the beginning. 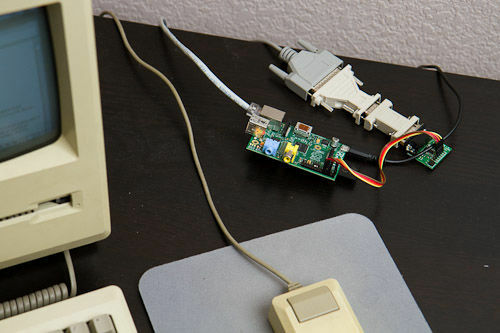 Keacher set up at the end of trial and errorRasberry PiToCategory 5 cableI came up with the idea of ​​connecting to the router with a router and managed to do it. Next, install the software for TCP / IP communication from FTP and run PPP client on Mac Plus and SLiRP,Raspberry PiGet PPP server for. It is set up so that it connects from MacTCP to MacPPP and SLiRP for using Ethernet from MacPPP appropriately, preparation for Internet connection is completed. However, when connecting to the Internet, new problems arise. Most of the current sites use name-based virtual hosting, but the Mac Web Plus browser Mac Web did not support name-based virtual hosting. In other words, most sites were not properly displayed even when connected to the Internet. Keacher who bumped into a wall impossible to solve by himself consulted a friend, and a friend said that he created a proxy solution in less than 20 minutes using a scripting language such as Python. I tried connecting it to the Internet again by using the code created by a friend, and successfully connected successfully. However, as expected by Keacher, the connection speed was quite slow, and it took quite a while to display the page. Keacher can check the Internet surfing on Mac Plus from the following. 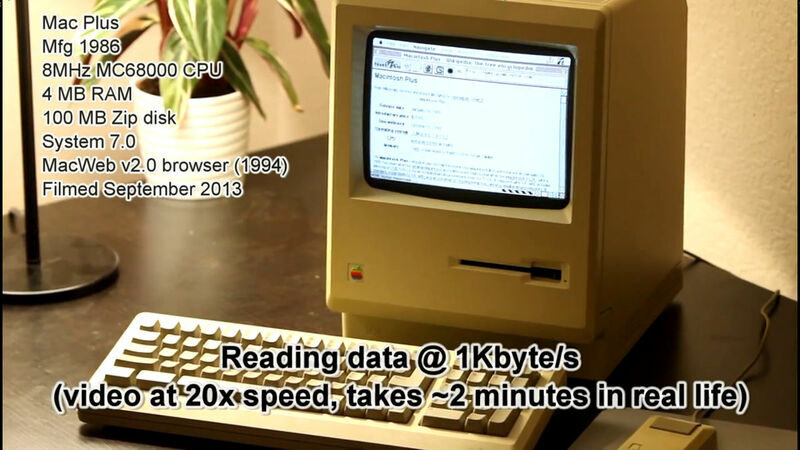 The reading speed is 1 KB per second. It is 8 kbps when corrected to the bit, onceAnalog modemThe speed of one seventh of the connection (56 kbps) using. After 2 minutes finally finished reading and rendering started. The page was displayed after 4 minutes. Keacher said that he thought that the rendering was so long that he freezed. 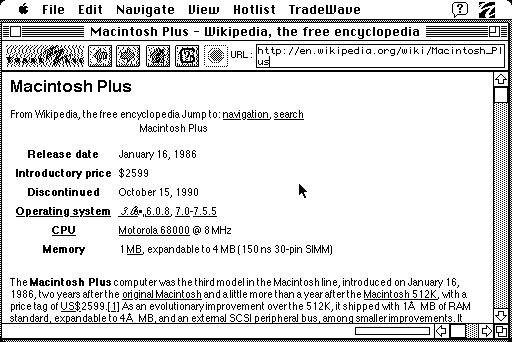 When you try to display the page of Wikipedia 's Mac Plus, it looks something like this, there is a classic atmosphere, this is ant for this. 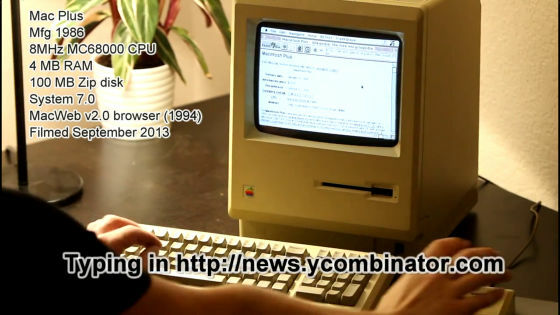 A strong man appears reproducing Apple II on the microcontroller board "Arduino Uno"